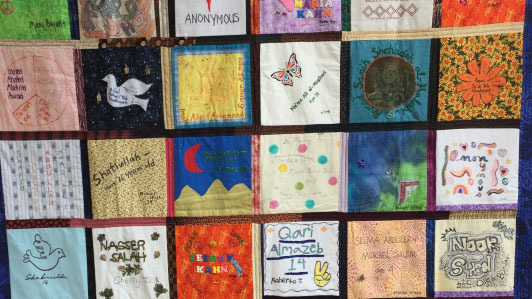 WAND is sponsoring an exhibition of 6 quilts from the Drones Quilt Project in memory of the victims of drone warfare. Location: Pulaski Heights United Methodist Church, Gathering Hall. Time: The quilts will be on display from Sunday, Sept. 16 through Sunday, Sept. 23. Sunday from 8:00 am – 6:00 pm. Monday through Friday from 8:00 am – 8:00 pm. Exhibition is closed on Saturday. Reception: There will be an opening reception in the Gathering Hall at PHUMC on Monday, Sept. 17 from 6:00 to 7:00 pm. Our featured speaker will be Michael Vaughn, an Army veteran, who worked with the drone program while in the military. We will also show a short video, Moral and Safe?, developed by the Interfaith Network on Drone Warfare.